On Oct. 23, Disney Parks Blog announced some extra holiday cheer for Adventureland at bothDisneyland Park in California andMagic Kingdom in Florida. 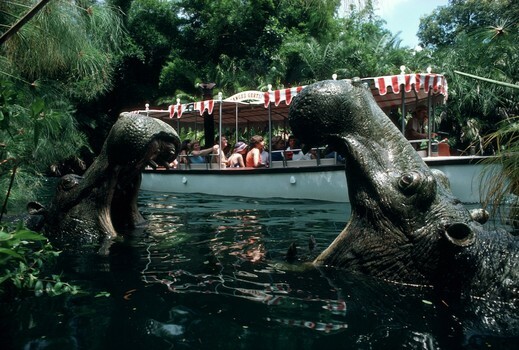 Jungle Cruise will receive its first-ever holiday makeover for Disney’sChristmas season. When Jungle Cruise becomes “Jingle Cruise” in early November, the classic boat ride will offer a seasonal storyline that adds audio and visual gags as well as holiday decorations. Best of all for fans of the Jungle Cruise, the Skippers will incorporate new jokes into Disney’s whirlwind tour of the world’s rivers. In keeping with the Jungle Cruise attraction, the focus of the holiday makeover is the Skipper and it has been given a light storyline. The Skippers have grown homesick and so they’ve spruced up the attraction by adding some special touches that observe the holiday season. Not only will the crew add decorations to the queue and boathouse, they will rename their boats in keeping with the spirit of the season. Some of the holiday decorations will be those sent to them from home, while others will be those the Skippers themselves have created. The attraction will feature a holiday-themed radio broadcast. ← Disneyland News – Zac Efron and Lily Collins Hold Hands at Disneyland – Are They Back Together?